Electronic fan clutches are used in longitudinally-mounted engines. They are installed in the direction of travel, in front of the radiator and are driven by either the V-belt or directly by the engine. The function of the fan clutch is to create the temperature-dependent friction connection to the fan wheel and to regulate its rotational speed as required. Together with the fan, it ensures that, especially under heavy load, the temperature of the cooling water remains within the optimum range and the engine does not overheat. If no cooling air is needed, the fan clutch switches off and rotates at a lower speed. Due to this demand-oriented temperature regulation, not only a more effective cooling is achieved, but also the increased demands on the engine’s thermal management can be met, which is in line with the exhaust emissions standards EURO 5 and EURO 6. In the case of using an electronically-controlled clutch, control is carried out directly via sensors, the values of which are processed by a regulator, which sends a control current to the integrated solenoid. With the help of a relay, the integrated valve is opened and the silicone oil contained in the reservoir can flow into the working chamber, whereby the rotational speed of the fan increases. An additional speed sensor closes the control loop when required. This optimum regulation results in a reduction of both noise and fuel consumption. Failure of the fan clutch can arise due to, for instance, damage caused by external influences, dirt or to poor or improper maintenance. 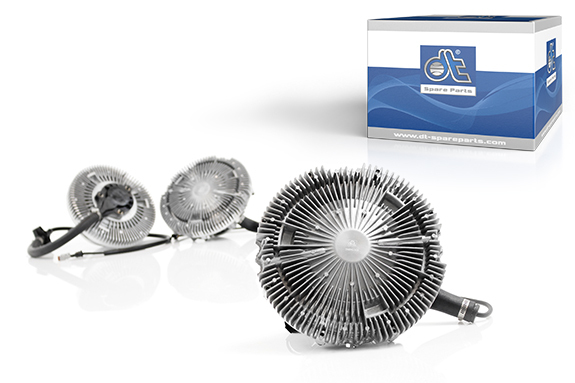 In addition to electronic fan clutches, DT® Spare Parts offers all standard clutches with bi-metal elements, fans and fan hubs.